Bobby Burns. Pic by Pacemaker. Bobby Burns has been a fixture in our domestic game for fewer than 65 appearances but heads off into full-time football with Hearts having left an indelible mark on the Irish League. The 18-year-old’s three-year contract in the professional scene presents an opportunity to maintain his stellar progress within an established structure designed to maximise every attribute and turn potential into a proven end product. Burns’ pathway into that professional environment stands testament to a growing faith across our Irish League clubs that the grassroots game can provide a pool of players ready for the high-stakes demands of competitive first-team football. 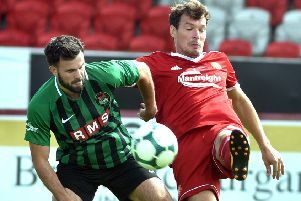 The foundation provided by the Irish League towards Burns’ development could serve as a successful feeder system into full-time football at first-team level. If Burns is the present success story of that formula, Paul Smyth’s route to QPR via Linfield can be considered the past and Crusaders’ Gavin Whyte the future given the level of interest across the water in the latter. A tally of 18 players invited from Irish League clubs into this weekend’s four-day training development camp organised by Northern Ireland under 21s offers extra evidence that home games can generate gains away from the domestic scene. It is a grounding Burns values and one from which he draws personal motivation alongside hopes of playing his part in offering incentives to those with similar ambition. “We probably all inspire each other, in terms of how Paul and Gavin have developed in the Irish League and also my move,” said Burns. “It would be great if that helps motivate those down the line and it has been great to see the younger talent really get those chances in the Irish League. “In fact, many of the clubs’ leading performers over the past season have been younger players and I think it comes down to the work done at underage international level with the ClubNI system then having clubs like Glenavon and Coleraine, especially, willing to hand out minutes. “Clubs seem to have more confidence now in younger players and Glenavon’s track record was why I joined, I owe a massive thanks to everyone who has helped me develop across my career. “Gary Hamilton was true to his word in terms of delivering on the promises he made to me when I signed for the club, in that he would give me playing time if I could prove I deserved it and that the club would never stand in the way of my progress. “The lessons you learn from the Irish League far outweigh anything from development games and I take confidence from my experiences with Knockbreda and Glenavon going into the Hearts move. “It is made clear at Glenavon that the business of the first team is to win games and that is key. Burns cites initial training sessions with Glenavon’s first-team squad as the perfect introduction before making his debut as a 15-year-old. A loan spell at Championship level with Knockbreda left Burns with enhanced tools to make the transition last season from prospect to an established name in the starting side back at Glenavon. “The banter is brilliant and one of the things I will miss the most from Glenavon, along with the friendships with people around so many other Irish League clubs,” said Burns. “It may have been a culture shock walking into that situation at 15 but you quickly learn to give and take the stick as part of a changing room. “Other senior players took time to help me and keep an eye on me, even in games when someone physically bigger might have a go. “I felt comfortable straight away at Glenavon thanks to how they helped me ease in. “At Knockbreda I did not know a single person at the club in any capacity but scored eight goals in eight games and managed to get off to a good start, so that helped the others accept me as a player. “The Championship is a different level outside the Premiership but that environment was great then, when I came back to Glenavon last season, I managed to score a few early goals. “All you can do is show your team-mates you can be trusted as it comes down to guys needing wins to earn a wage and help support a family. “You hear older players talk about things like mortgage payments and it hits home. “There is a certain level of responsibility but your levels of confidence increase as you learn to adjust. “I played at left-back in midfield or up front but always just tried, within reason, to focus on my own game of working hard and keeping up the high energy levels. “I always made a point of listening to the manager when he was offering instructions to other players, so that helped me understand.